Marcelo Ebrard, appointed by Lopez Obrador as his foreign minister, pledged Mexico will stick to its non-interventionist tradition. Junly 9 (teleSUR) Mexico will stick to its “non-interventionism” foreign policy towards Venezuela and Nicaragua and avoid any aggressive stance which normally responds to “an agenda promoted by the United States,” said the future foreign affairs minister Marcelo Ebrard. “The general position is that we must avoid intervention… we think that we must have a very careful stance because what we normally have is in great part an agenda promoted by the United States,” he said. 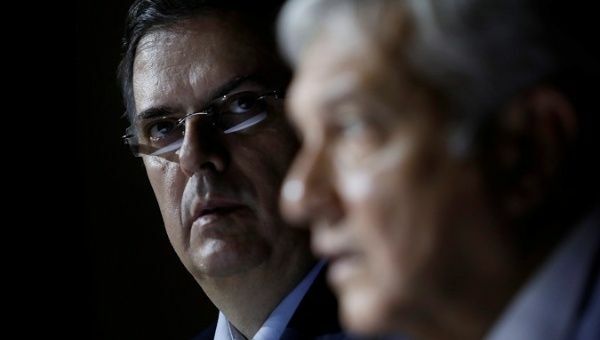 Ebrard said his country won’t interfere in the internal affairs of Venezuela, Nicaragua or Brazil, starting on Dec. 1, when the center-left Andres Manuel Lopez Obrador takes office, as stated in the constitution. Mexico’s long history of non-interventionism is based on its “Estrada Doctrine,” named after the ex-Minister Genaro Estrada, published in 1930, which states that Mexico won’t recognize or disqualify any foreign government, especially if coming from revolutionary movement. Doing otherwise would be interpreted as an intervention in internal politics. Therefore, Ebrard considered that using the Organizations of American States (OAS) to denounce other nation’s internal affairs to be interventionism. “What has intervention lead to?” asked Ebrard, reminding listeners that the former president Vicente Fox (2000-2006) departed from the doctrine and took “very difficult to understand positions,” that didn’t benefit Mexico, such as worsening relations with the Bolivarian government. “We will be respectful of non-interventionism. This doesn’t mean we don’t care about the situation in other countries. We will see what we plan and how can be contribute in the best way possible,” he said when inquired about Venezuela. Ebrard was mayor of Mexico City between 2006 and 2012, succeding AMLO. He left the Mexican political scene in 2015 after breaking up with his party, the Democratic Revolution Party (PRD) which is now crumbling. He was recently appointed by AMLO to be his foreign affairs minister when taking office. He promised to adopt a strong stance during the NAFTA negotiations in order to defend the commercial interests of Mexico. He also said the new foreign ministry will be affected by the new proposed “austerity” plan, which plans to reduce government spending on bureaucracy, and that the new agenda will be strongly based on human rights. Lopez Obrador will meet with several world leaders during the Pacific Alliance Summit, to take place on Puerto Vallarta on July 23 and 24.